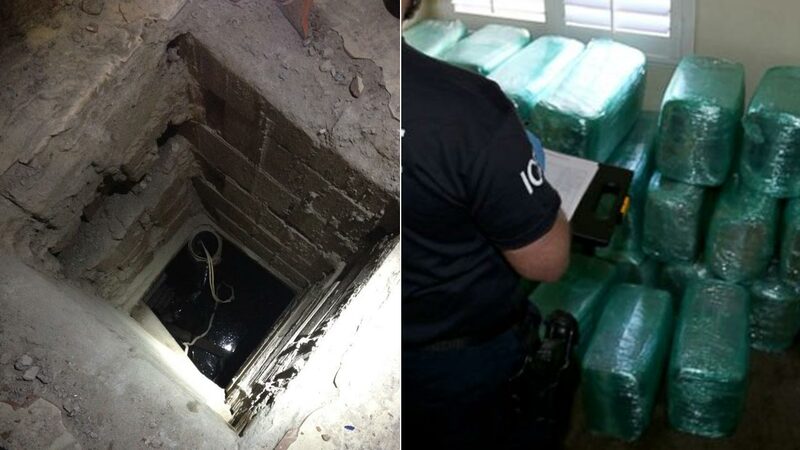 CALEXICO, Calif. -- Four people were arrested and more than a ton of marijuana was confiscated after federal agents discovered a drug-smuggling tunnel that connected a home in California to a restaurant in Mexico. The home is located at 902 E. Third Street in Calexico, a border city east of San Diego. U.S. Immigration and Customs Enforcement investigators said traffickers paid $240,000 for the property and built a brand new $86,000 home with three bedrooms and two bathrooms in April 2015. The home had a hole in the living room giving access to the tunnel. This is the first time that drug traffickers purchased property and built a house for the sole purpose of hiding a drug tunnel in the area, said U.S. Attorney for the Southern District of California Laura Duffy. The hole in the Calexico home was around 3 feet wide and led to a shaft, which descended around 32 feet underground, connecting to the tunnel. 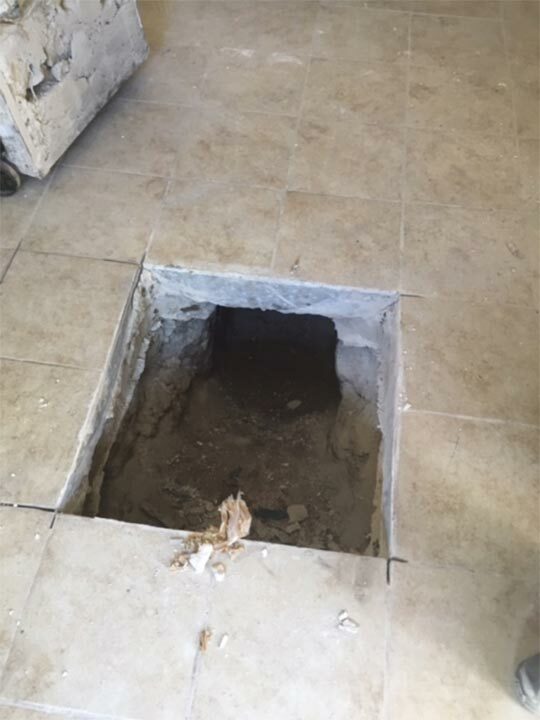 A 3-foot-wide hole in a Calexico home was the entry to the drug tunnel that connected to a restaurant in Mexico. The tunnel was 415 yards in length and approximately 300 yards from the border, officials said. It served major drug trafficking organizations south of the border and had been in operation since last month. The tunnel connected to a functioning restaurant in Mexicali, Mexico. 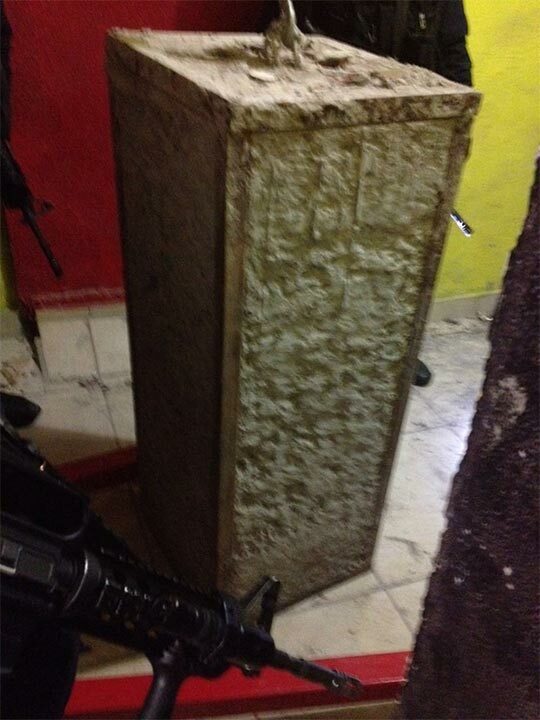 A large plug was found at the entry of the drug tunnel at a restaurant in Mexico. Bundles of marijuana wrapped in plastic were found inside the tunnel. More marijuana was found at separate stash and warehousing locations in Calexico, totaling over 1,350 pounds with an estimated street value of $6 million. The four people who were arrested face various charges, including drug trafficking, money laundering and other offenses. Two were taken into custody in Arizona and two in Calexico. 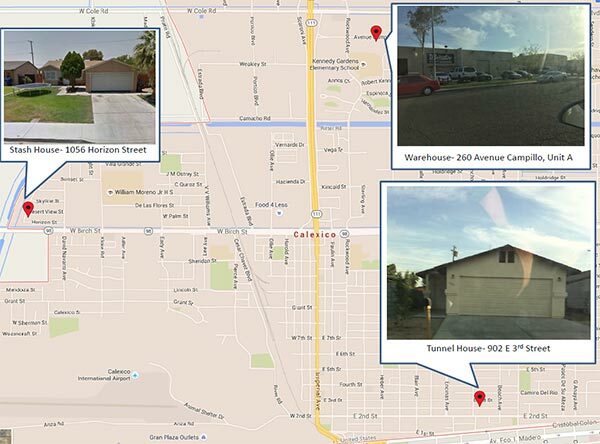 This map shows the location of the house in Calexico with the entry of a drug tunnel that led to Mexico, as well as a stash and warehouse location allegedly used by traffickers. "This house and tunnel were constructed right under the watchful eye of law enforcement. For the builders, the financiers and the operators of these sophisticated tunnels, there is no light at the end of the tunnel. We will seize your drugs and your tunnel before you even have a chance to use it," Duffy said. Investigators said they've identified a cartel in Mexico but did not release details on whether arrests have been made there. Over the past five years, federal authorities have discovered more than 75 smuggling tunnels, most of which were in California and Arizona.